Perfectly prepared and ready to serve, these bottles let you savour the delicate floral tones of Bloom gin balanced by the distinctive herbal and plant-root notes of Fentimans tonic. An elegant and refreshing drink. Serve over ice and garnish with strawberries for a real summer favourite. 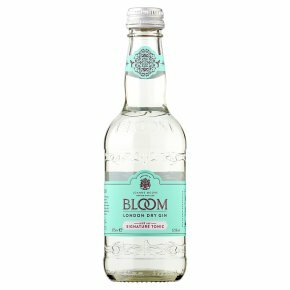 Silver Medal - Pre-Mixed Challenge Awards 2015.BLOOM Gin and Fentiman's have teamed up to produce the ideal G & T. A 'perfectly balanced, perfectly blended premium cocktail' to enjoy at home or on the move. The flavour of the delicate and floral notes of chamomile, honeysuckle and pomelo in BLOOM London Dry Gin work beautifully with the distinctive herbal and plant root notes of Fentiman's Botanically Brewed Tonic Water. This pre-mixed G & T is presented in a classic Fentiman's curved glass bottle.